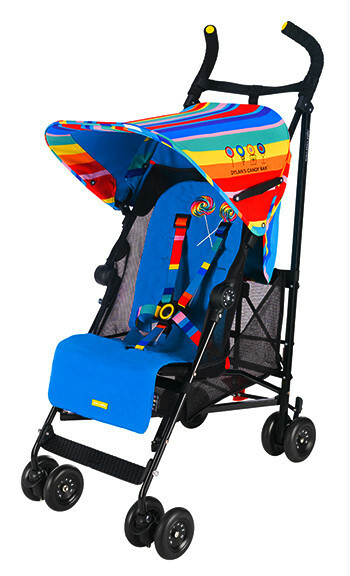 Mummy-Tips: Win the new Maclaren Dylan's Candy Bar Buggy! Win the new Maclaren Dylan's Candy Bar Buggy! I've always had more than a natural interest in pushchairs and I absolutely love this quirky addition to Maclaren's 'Objects of Design' Collection. This funky new buggy is a collaboration with Dylan's Candy Bar Founder (and Ralph Lauren's daughter), Dylan Lauren and is just perfect for summer. Fun, bright and whimsical, it's just like Dylan's signature US candy stores, it looks good enough to eat! Based on Maclaren's gold standard Volo frame, this simple, practical, lightweight (4kg) buggy is perfect for travelling. It's not available in the UK until August 1st - but I have one to give away. Enter using the subscribe button below. For an additional chance to win, leave a comment stating the weight of the Volo frame. Competition terms and conditions. Entry closes at midnight on 31/7/11. You can stay up to date with Maclaren news by 'Liking' them on Facebook and following them on Twitter. The competition is now closed : @petitmew is the winner! WOW LOVE that design! Its gorgeous! 4kg - and it looks gorgeous! 4kg over 4 times my baby's birthweight and we need it for our summer hols! NEED!!! omg it only weighs 4kg, im doing my back in with mine at the moment with the little one and the shopping, would help if the buggy was light to begin with. Have the 'Quest' but could do with an update esp this funky design! This pushchair is gorgeous and it would be so useful right about now ! It's 4kg and looks so bright and fun - I love it! 4kg I love this buggy! I am subscribed to your blog by email. This must be fate-I have a 2 year old called Dylan. Its 4kg perfect weight for busy Mums and heavy babies! I love this design, so funky! At just 4kg, The Maclaren Dylan's Candy Bar Buggy is 'baby weight' that we won't need to worry about! I love the bright colours and at only 4kgs! 4kg - please let it be be, I have never won anything! This is a gorgeous buggy! stunning buggy, fingers crossed, I love it! The frame weighs 4 kg - this is how much weight I put on from 6 week booking in appointment to my 12 week scan!! oh and 4kg weight. Sorry. fantasticly colourful and only 4kg wow! !